If you are a homeschooler, sooner or later you will hear a child proclaim, “This is hard!” As a matter of fact, you may hear those words coming out of your own mouth! Whether your child is gifted and sails easily through their schoolwork or is a struggling learner, sooner or later your child will encounter a task that is highly challenging. In that moment, you also have a decision to make. How should you respond to a child’s lament about hard tasks? It may be tempting to intervene on your child’s behalf, because you don’t want him to become frustrated and resistant to further schoolwork as a result. When you see your child’s patience waver and sense the tension rising it is only natural to want to prevent further escalation. To be honest, it might be easier to at least temporarily bypass the hard task in favor of something more readily achievable. This is especially true when the child is prone to emotional meltdowns when frustrated. Some children decide a task is hard, so they anticipate failure and give up without really trying. They have already made up their minds that this particular task is beyond their reach. Sensitive children may feel inferior even though they have not failed at the task that has not yet been attempted. Other children may resent that they have been presented with something they consider hard and therefore feel it is unreasonable for the adult to expect them to complete it. These children who give up easily or don’t even begin a task that they perceive to be challenging require a discerning adult to figure out the reasons they are so resistant to taking on a challenge. In my case, I was a child who did not want to do anything that I wasn’t good at or could not quickly master. For example, I wanted to be able to play beautiful music on the piano, but after a couple years of lessons I realized I had gotten a much later start than most of the other pupils and I would not become proficient in the time I could allot to practicing the piano. So I quit piano lessons, even though I enjoyed playing the piano, because I wanted to play well or not at all. I felt the same way about most games. I played pinball games a few times and decided it was not for me because it would take a lot of quarters and practice to become adept at it and I didn’t want to expend the time or money to learn the necessary skills. As I homeschooled my children, I initially would respond to their statement “It’s too hard” with “No, it’s not. You can do this”. This led to the unfruitful exchange of “No, I can’t” and “Yes, you can” which accomplished nothing other than to fuel the frustration for my children and for me. Over time, I learned to recognize when my children were just being lazy and when there was truly a hindrance to learning. Wouldn’t you want to respond to laziness very differently from the way you respond to a child who is genuinely stumped by an assignment? I sure did. When I thought my children were just trying to get out of work that they found less interesting than their preferred pursuits, I determined that they needed to finish the assignment even if they claimed it was hard. I would discuss with them the reality that they would be called upon to do hard things throughout their lives, and they might as well start learning to discipline themselves to work diligently because they would need to be able to do so for the rest of their lives. Complaining that the work is too hard only makes the task seem more unpleasant as it stretches out for longer periods of time than it would if the children just settled down and got the job done. During the times when I realized my children had legitimate reasons for feeling that a task was too hard, I responded very differently. First, I pointed out that we all need help with things and that it was fine to ask for assistance. When a child proclaims, “It’s too hard!” he has already given up without even trying. That attitude won’t serve him well in life. A child needs to learn how to persist and work hard. So while it is true that there will be times when a child is asked to do something he is not yet able to do, giving up is not the answer. I told my children that it was fine to ask for help when they needed it, but not acceptable to just decide to give up because something seems like it is too hard. The mindset of “I need some help to be able to do this” is very different from the mindset of “I can’t. This is too hard.” Can you picture teaching your child this lesson? If so, you will not only be helping them succeed with homeschooling, you will be equipping them for life as adults. Ask First – Purr, Ya Varmint! Children with AD/HD are often impulsive. Sometimes, this adds to their charm as they blurt out amusing observations and thoughts. Other times, it gets them in trouble as they…blurt out their observations and thoughts! One positive aspect of impulsivity is that I rarely have to wonder how my daughter feels or what she really thinks about things. Especially when she was in the preschool and elementary years, I rarely had to ask for her opinion because she made it readily apparent. Actually, I do want to know what my children think and how they are feeling but with Beckie I didn’t usually have enough time to ask before she was announcing her thoughts to all within earshot. Some of the “This could get you in trouble” (and hopefully also teachable) moments happened with regularity. Beckie was an avid reader and a very verbal child, and frequently she would use words she’d heard or read without knowing what they meant. Sometimes I could tell when she was trying out a word she’d read by the way she pronounced it such as when she used the phonetic pronunciation of the word “ballet”. Other times, she just picked up words from various sources and tried them out. When we got our kitten, Wesley, she was eager to hear him purr. Beckie held him in her arms, stroking his fur and crooning to him, “Purr, ya varmint!” This was immediately followed by, “What’s a varmint?” My refrain became, “Ask first, then try out the word if it’s appropriate for what you’re trying to say.” Then I would tell her what the word meant. Beckie has gotten better at suppressing her impulsive tendency to say whatever she is thinking, though it still happens sometimes. In a way, I miss hearing her developing her vocabulary by trying out new words on me. I wonder how many school-age children could be considered reluctant writers. I know from my own experience and from talking with hundreds of people at homeschool conferences that reluctant writers are not uncommon. It seems to occur with a higher percentage in boys, and there’s a very high correlation in children with fine motor delays and attention challenges. Yet writing is such a fundamental skill for academic tasks, and not just for “official” writing curriculum that we have to help our children attain competency in this area. Students must demonstrate adequate writing skills for math calculations and to provide written responses to questions in nearly every subject area. My son, Josh, was a doodler and picture-drawing fiend from the time he could hold a pencil. That boy loved to draw, and decorated the margins of his workbooks and school pages with detailed artwork. But he hated to write letters and numbers, so the same pencil he enjoyed drawing with became the hated enemy pencil he was expected to write with for school. When you have a reluctant writer, you can end up with a resistant student. There are a few things I tried that helped us get the work done with neither of us becoming too traumatized in the process. First, I acknowledged to myself that boys tend to mature later than girls, and children with AD/HD tend to be 2-4 years LESS mature than their same-age peers without AD/HD. So when I’m working with my 7 year-old AD/HD son, I’m dealing with a maturity level of a typically developing 3-5 year-old boy. Expectations need to be adjusted to fit who you are working with so you can challenge without frustrating as you help skills be developed. The second point I tried to remember was that curriculum is a tool for teachers to measure comprehension and progress. For a handwriting curriculum, that is best assessed by actual writing samples since that is what is being targeted. For other subject areas, I can assess comprehension orally some of the time. I still have written samples of work in each subject area, but I do not need to have my child write down every answer every time when they can quickly and easily tell me their responses and I can gauge their level of understanding. This lessened frustration a great deal for Josh, who was bright and could express himself orally but struggled to form the written words. Writing was a long, laborious process for him and sustaining attention and focus for topics that weren’t highly interesting to him was beyond challenging. Sometimes I let him combine his love of drawing with a writing assignment. I found paper that was lined on the lower half and left the top half blank. 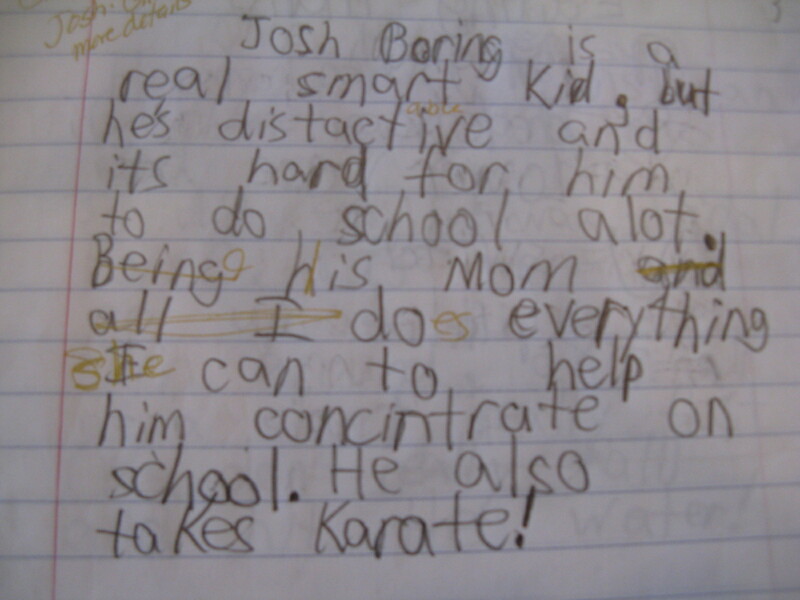 Josh could write his sentences on the lower half (half a page of writing was less intimidating to him) and he could illustrate his ideas on the upper half of the paper. This was far more appealing to him than writing alone, so he was less reluctant to do the writing task. Today as a young adult, my son who was an extremely reluctant writer back in elementary school has developed such a passion for writing that he has written three science fiction novels and has plans for several more books. Take heart, teachers of reluctant writers! There may yet be an author inside that child. A mom wrote to me about her 7 year old son, asking for suggestions for a language arts curriculum. Her son has been diagnosed with AD/HD, and like many others he is creative, distractible, and likes some subjects better than others. Since my son had extreme likes and dislikes at that age, I could have spent a fortune trying to find a curriculum that worked for every subject area. Personally, I liked the pre-packed, one-company-for-all-subjects curriculum. That would have worked for only one of my three students, and I figured out that the struggles my son had would be an issue no matter what materials we used. So I learned ways to adapt and supplement what I had already purchased. Here are the things I suggested for consideration to the mom who contacted me about language arts: I would suggest that you try and figure out what it is about your current language arts curriculum that your son dislikes or is struggling with as he does various assignments. For example, if there is a lot of writing involved and he is a reluctant writer, then it makes sense that he is resistant with a curriculum that is heavy on writing. Maybe he needs help learning a proper pencil grip so his hand doesn’t hurt, or maybe he needs his vision checked because it’s hard for him to visually track when he reads. Does your son have an expressive or receptive language delay? If so, speech therapy type activities could help develop his language skills so that he can communicate more effectively in all domains. Try to see through his eyes and observe him. Ask yourself questions such as “Is the amount of print on the page overwhelming?” If your son takes one look at a page and thinks “This is going to take a long time”, that notion is enough to send an AD/HD child off on a tangent! It’s not because the work is too difficult for them, but because they dread spending much time on subjects that are not as interesting for them. There may be ways you can modify the curriculum you have now to make it work better for your family. With the flexibility of homeschooling, you can make modifications. Consider doing a half lesson a day, or splitting the language arts time into two sessions with other subjects in between. Allow your son to answer some questions orally instead of writing them down. Yes, he needs to learn to write. But as long as he is writing some of the time, it is acceptable to check his comprehension orally to see if he is mastering the material. Instead of a book report, he could draw you a picture and tell you what he learned from the book. He could do a shoebox diorama to depict some concepts. Remember, the goal is for him to learn the material, not just to finish the curriculum. These types of options allow him to be creative and show what he knows in ways that fit with how he learns. You could also utilize topics that interest him, and instead of using the written passages in the curriculum you have you could substitute sentences or paragraphs from books that you know your son will like while still teaching the skill the text intended. Maybe he could come up with some of his own sentences or ways to practice the skill being addressed by the curriculum. You will still need some written documentation, but a creative child like you described may come up with ways to demonstrate his knowledge that will be acceptable to you in addition to some of the traditional curriculum assignments. I hope this is helpful for you, and I wish you and your son much success in your home schooling endeavors.